This peak is not in the book. 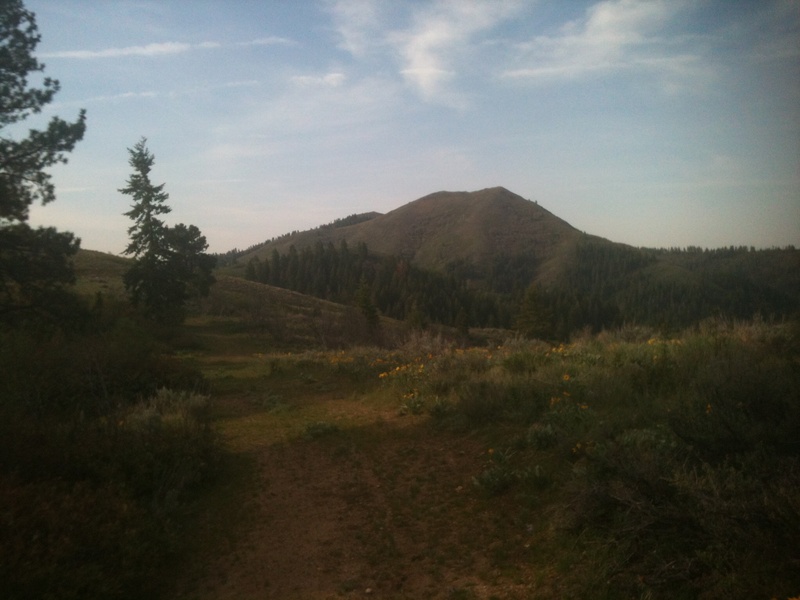 It is a great training peak and rewarding hike. 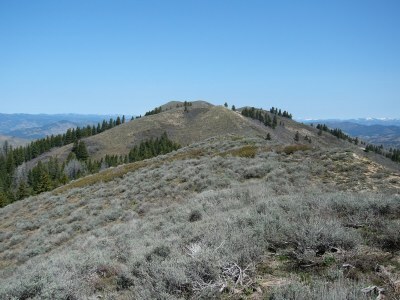 Mount Heinen is located in the Boise Mountains, in the Boise National Forest, about 4 miles north-northwest of Arrowrock Reservoir. This peak is one of the four peaks of the Grand Slam Peaks, the other three peaks are Kepros Mountain, Cervidae Peak, and Shaw Mountain. Mount Heinen is the tallest of the Grand Slam Peaks. 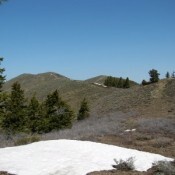 It is a great early season hike, but it is a strenuous climb from any direction. There are three routes outlined below. 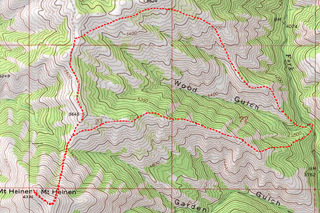 The standard route, the Orth / Koehler route, and the North Face route. 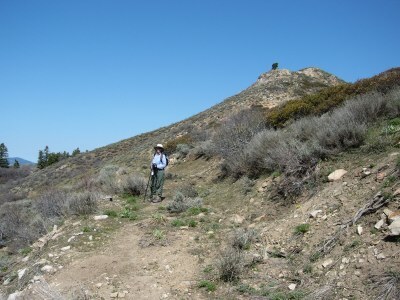 The route starts on the northwest side of Arrowrock Reservoir. Park just north of the Irish Creek Boat Ramp. A motorcycle track can be viewed from this spot that climbs up the steep slopes to the west. Follow this track upwards and to the northeast toward Point 5402. 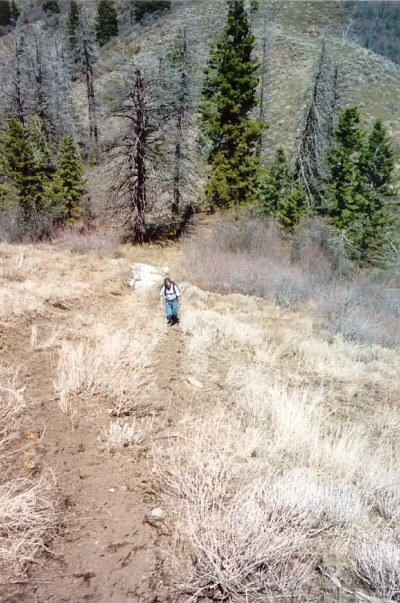 The route follows a fire break until just south of Point 6137. 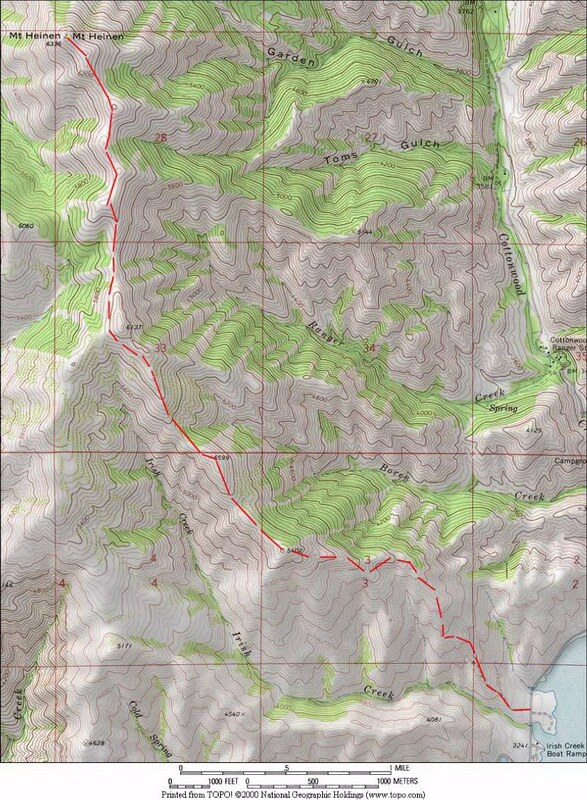 Traverse around Point 6137 and then continue north along the ridge that leads to Mount Heinen. This is a long, strenuous route. Take lots of water. See (C) Middle Fork Boise River Road Approaches on page 154 of Idaho – A Climbing Guide for full access information. The standard, southeast ridge route to Mount Heinen. 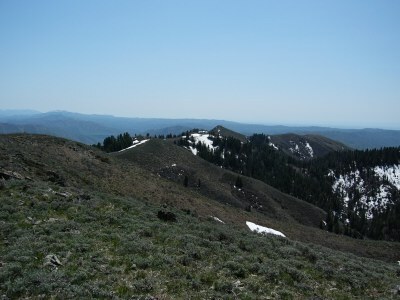 View of the summit from near the top of Point 5402. Point 5402 and the summit. Brian Orth, Toni Orth, and Abe Koehler hiked this alternative approach to the summit. Approaching the north side of Heinen. Climbing up the steep north side of the peak. 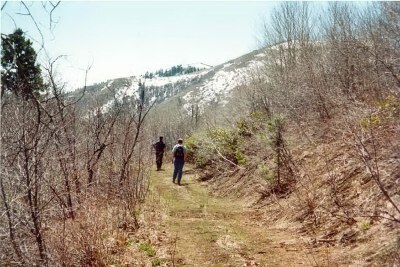 This route leaves FS-377 at the top of the North Fork Cottonwood Creek. This road is accessed from the Middle Fork Boise River Road (see page 154 in the Climbing Guide) at a well marked intersection at the top end of Arrowrock Reservoir. Take the road up to the saddle and park. The route starts as a closed logging road. The road is not well mapped on either the Forest Service or USGS maps. 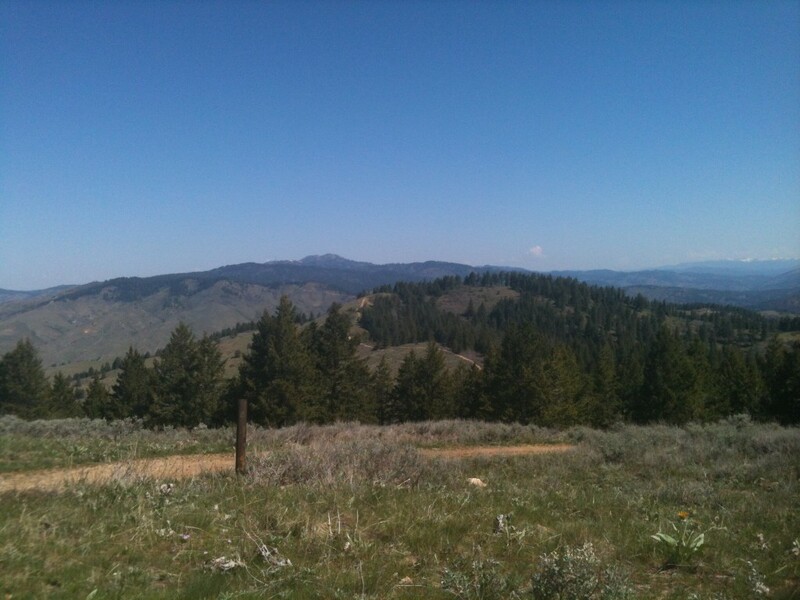 Take the first left and the road leads to the ridge top and then heads south toward Mount Heinen. Keep right at the next junction. At the next junction, the road cuts on the east side of the ridge for a short stretch and then contours up to the ridge top. From this point, just stay on top of the ridge until you reach the top of Peak 5740 directly north of the peak. The road ends at this point and a trail continues down into the saddle and then steeply climbs to the peak’s summit ridge. Hike west to the summit. I usually ride my bike to Peak 5740 and this makes the descent to the car a delight! The summit of Mount Heinen as you approach from the north. 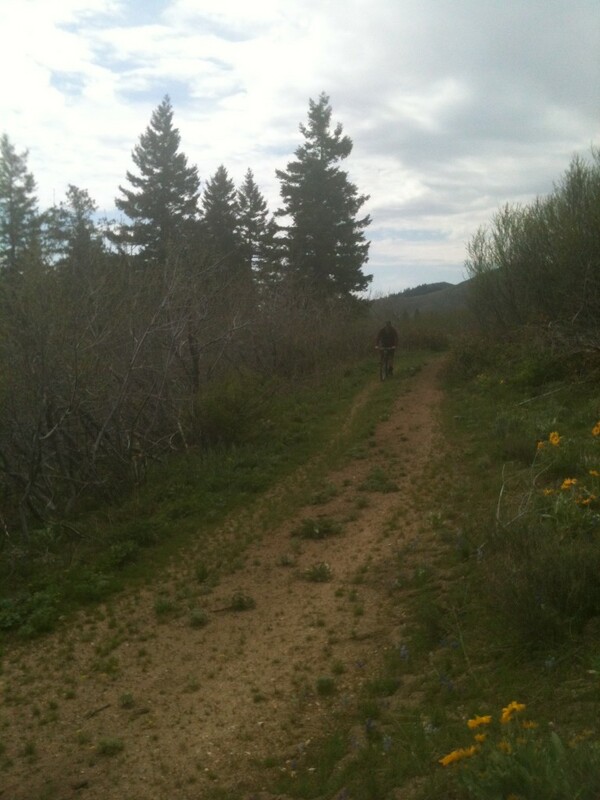 The ridge top road is good enough for mountain biking. I have never been on this road when the gate was open. 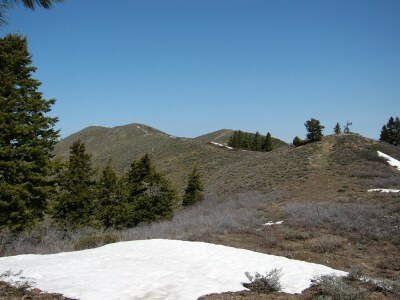 Whether you are walking or riding a bike, the north ridge is delightful in late Spring and early Summer.